Nan Madol has never been "lost" as the title of this item implies, but this fantastic complex of 92 artificial islets sees few tourists. Located on Pohnpei (formerly spelled "Ponape") in Micronesia, Nan Madol lacks the well-publicized glamour of the Pyramids and Chichen Itza. If Nan Madol is not glamourous, it is certainly incongruous. Who would expect such huge stone structures to rise in the middle of nowhere? "To withstand time and the sea, the artificial platforms were built in a staggeringly laborious process. 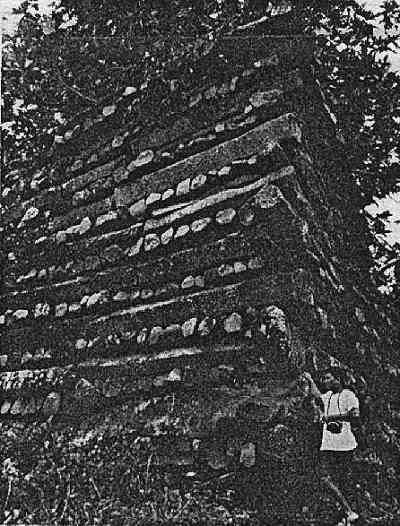 Multiton basalt columns, formed by volcanic activity, were stacked horizontally, log-cabin style, to form outer walls. The inside was then filled with coral rubble to form a dry surface several feet above high-tide level. Radiocarbon testing finds signs of human habitation at Nan Madol as early as A.D. 500, and the megalithic construction was completed by about 1500." Besides incongruity and a certain bizarreness, Nan Madol does pose several problems: How were the huge, very heavy prismatic columns of basalt quarried and transported? Why was Nan Madol built at all? Why about 1400 AD did the inhabitants stop building their massive ocean-going canoes and begin a decline? Comment. An associated question asks why the builders of Nan Madol, the Maya, the Hohokam, the Moundbuilders, and other cultures all decline so precipitously at about the same period? See the accompanying article on the bubonic plague. Reference. For more on Nan Madol, see our catalog Ancient Man. It is described here. A portion of "temple" at Nan Madol. It is contructed from natually occurring basalt prisms. (Courtesy Bishop Museum; also from Ancient Man).